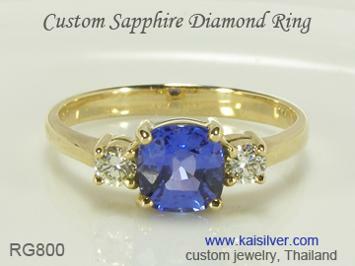 Many of you would be surprised to see Kaisilver offering silver rings with tanzanite gems. Traditionally silver has always been the precious metal for cheaper jewelry with synthetic or imitation gems. Let's add to the list of surprises by giving you some more amazing facts, about this tanzanite claddagh ring crafted in sterling silver. The RG802 tanzanite ring boasts of a natural handpicked tanzanite gemstone, no left over stocks and no cheap imitation look alike stones. At Kaisilver the same team of dedicated artisans and jewelry production experts, work on both gold and silver jewelry orders. The team is driven by a passion to create quality jewelry and does not rely on high priced merchandise to stay motivated, all buyer preferences are respected. Sterling silver has in recent years attracted the attention of many seasoned jewelry lovers, they have come to appreciate the metal for its classic appeal. Describing this tanzanite claddagh ring is truly exciting, we are talking about a unique gemstone, a timeless metal and a ring that was first made about four centuries ago. Like all Kaisilver custom jewelry, you can order this ring in gold or silver. Let's begin by discussing the main features of the ring. 925 Sterling silver ring with fine craftsmanship and good metal weight. Handpicked 7mm heart shaped natural tanzanite gemstone. Each gem is cut by very skilled gem artisans from Thailand. Custom made in all ring sizes, with the gemstone of your choice. Options for rhodium or gold plating but, we recommend that the ring be left un-plated. Ring retains all the essential features of the original 4 centuries old claddagh ring. Tanzanite is a gemstone that defines a class by itself, the gemstone had a meteoric rise to fame after it was first found as recently as in 1967. The fact that the gemstone is very rare can be judged from the fact that, it remained hidden within the embrace of nature for millions of years. It is quite interesting to learn that, every tanzanite ever seen on the planet including the gem in this tanzanite silver claddagh ring, comes from one small patch of land in Tanzania. A small stretch of land on the foothills of Mount Kilimanjaro, is the only place on earth where gem quality tanzanite is mined. The gemstone is formed from the mineral zoisite. Famous jeweler Tiffanys, named the gemstone Tanzanite after the only place where it is mined. The jeweler believed that a name like 'blue zoisite' sounded much like the English word 'suicide'! Given the limited space in which the gemstone is mined, it is not hard to believe that tanzanite is rarer than diamonds. Experts put that in an objective perspective and agree that, tanzanite is at least 1,000 times rarer than diamond. When you wear this silver tanzanite ring, you experience the true excitement of owning a gem that is gorgeous and also extremely rare. It is not very often that the birthstone charts have been altered, the beauty and popularity of this amazing violet-blue gem impressed one and all - in the year 2002, tanzanite was added to the list of December birthstones. The Claddagh Ring, is acclaimed to be history's most meaningful jewel. The first claddagh ring was made by an Irish slave named Robert Joyce around 4 centuries ago. The young man made the jewel hoping to gift it to his beloved once he was freed from slavery. Robert wanted the features in the ring to symbolize his true feelings for his beloved and these feelings, were embodied in the heart, crown and hands depicted in the ring. The Kaisilver silver tanzanite claddagh ring, retains the features and original significance of this historic jewel. The hands show friendship and togetherness, the crown signifies loyalty and the heart showed his love for her. The ring is often referred to as the 'hands and heart ring' or the 'hands clasping the heart ring'. The story had a happy ending when, Robert Joyce was one day freed from slavery and went back to his small fishing village (named Claddagh). He rushed to meet his beloved who was still waiting for him patiently, he gave her the ring and the couple were soon married and lived happily ever after. The ring came to be named 'claddagh' after the Irish fishing village in which the couple lived. The story which highlights the true love between two humans soon began to spread far and wide. The ring earned tremendous fame and Kaisilver has played a major role in recent times to, let people across the globe know about this amazing jewel. Your silver tanzanite claddagh ring, combines a gorgeous and very rare gem and a ring that is hailed as the most meaningful jewel in history. While you can order this tanzanite claddagh ring in gold or silver, let us talk about the silver metal option since that is the theme of this report. Unlike most jewelers who provide substandard workmanship and gemstones for silver jewelry, we at Kaisilver give equal attention to the quality of gold and 925 silver jewelry. You are therefore assured of a fine silver tanzanite claddagh ring, one that you will be proud to wear and own. You might have heard that plating a silver jewel with rhodium, gold or platinum prevents the jewel from tarnishing. At Kaisilver we can plate your 925 silver tanzanite ring with white rhodium, yellow gold, rose gold or even platinum however, we strongly recommend that you leave your ring un-plated. The reason is because, any plating done on silver will come off after some time, when this happens the ring appears patchy and cleaning the ring could pose a major challenge. On the other hand, leaving your sterling silver tanzanite ring with no plating, will make it easier to clean and polish the jewel. Discuss this issue with our support experts if you need any clarifications related to plating. Buying: Before you jump to place your order for this tanzanite silver ring or any other jewel from Kaisilver, please take the time to read the detailed information provided above. Do contact our expert team at sales@kaisilver.com with any questions or requirements that you might have. Once you have all the information needed to make a purchase, move to the payment stage. We accept payments through Paypal and Western Union but feel that, Paypal offers better peace of mind for you and us. Let us know which mode of payment you prefer and we will provide details for the same. There is a production time of 4 to 6 weeks from the date of order confirmation and receipt of payment. Your parcel will ship through FEDEX with web tracking and you will be provided with the tracking number the moment the parcel ships. 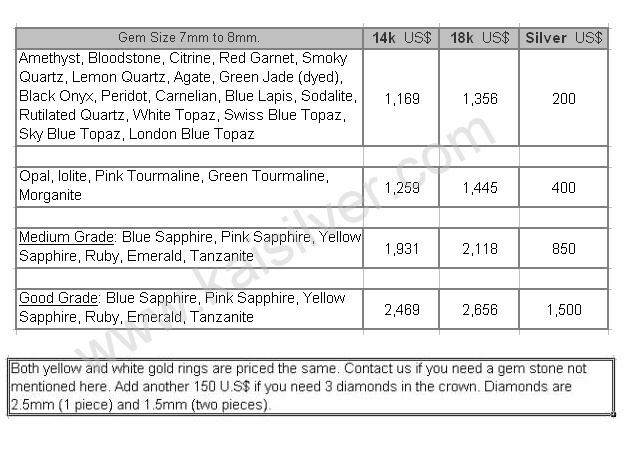 There is a 35 U.S$ shipping charge to be paid and this will be added to the price quoted in the price table above. Kaisilver: We are regarded as the leading online custom made jewelry provider and craft all types of jewelry in gold or sterling silver. The design for your jewelry can be yours or ours and we do not place any limitation on gem selection. Over 7,000 gem and jewelry lovers spread across the world rely on Kaisilver for all their requirements. Some of Thailand's finest craftsmen and gem artisans work on our gold and silver jewelry ensuring that, each jewel gets complete attention to detail - this irrespective of the choice of metal and price point. You can contact us for any information that you might need at sales@kaisilver.com we also welcome, your own design ideas and sketches to be custom made. The meaning and significance of the ancient claddagh ring makes it suitable for both men and ladies. 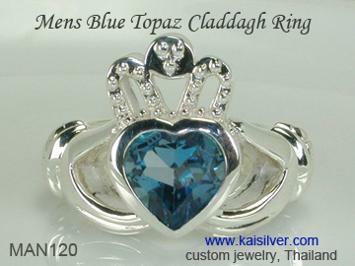 Kaisilver crafts claddagh rings in gold or 925 sterling silver with the gemstone of your choice. You can also request for a men's plain claddagh ring with no gemstone. Review this and other high end rings for men ... here. With sapphires being increasingly seen in engagement ring, the gemstone supports a high price point. Review some fascinating sapphire gemstone rings, reasonably priced but perfectly suitable for engagement or wedding rings. Read the report and see some stunning sapphire gold and sterling silver rings ... here.